At the cottage, a pretty terrace and garden also invite relaxation (table, chairs, parasol, barbecue and deckchairs). The cottage is furnished, with one bedroom (bed 160 x 200cm), a mezzanine which could be used as another sleeping room area for children, a salon with a sofa (which can be converted in a bed for 2 persons - 140 x 190 cm), TV and a wood-burning stove ; bathroom and shower ; fully equipped kitchen with refrigerator / freezer and clothes washer.There is a private parking. Bed sheets are provided, and towels can be rented. Maid service can also be available. Very friendly and respectful family. We will welcome them again with great pleasure. We absolutely loved our stay! The hosts were great and the house was clean, warm, and a perfect place for us to stay for our visit to France and Geneva Switzerland. Même si les photos sont tout à fait le reflet de cette maison, l'impression est encore bien meilleure en y entrant. On s'y sent bien immédiatement. Nous y sommes allés à quatre avec nos grands enfants de 18 et 21 ans (+ notre chien malamute d'Alaska) et malgré ses petites dimensions nous n'étions pas à l'étroit. Tout est là pour passer d'agréables vacances. Marie-Line et Michel sont adorables. Bon accueil, gîte conforme à la description, calme et tranquillité, tout est réuni pour passer un bon séjour. nous avons passé un très agréable séjour, la maison est très bien entretenue et vraiment agréable. Nos trois enfants ont dormi dans la mezzanine, et ils étaient ravis. Les propriétaires sont très accueillants et sympathiques et fournissent plein de documentations pour faire de petites ou grandes randonnées dans la région. Je recommande vraiment cette location, pas de mauvaise surprise, bien au contraire. Take the motorway in direction to Chamonix. Go out at n° 17. The cottage is 3 km further. 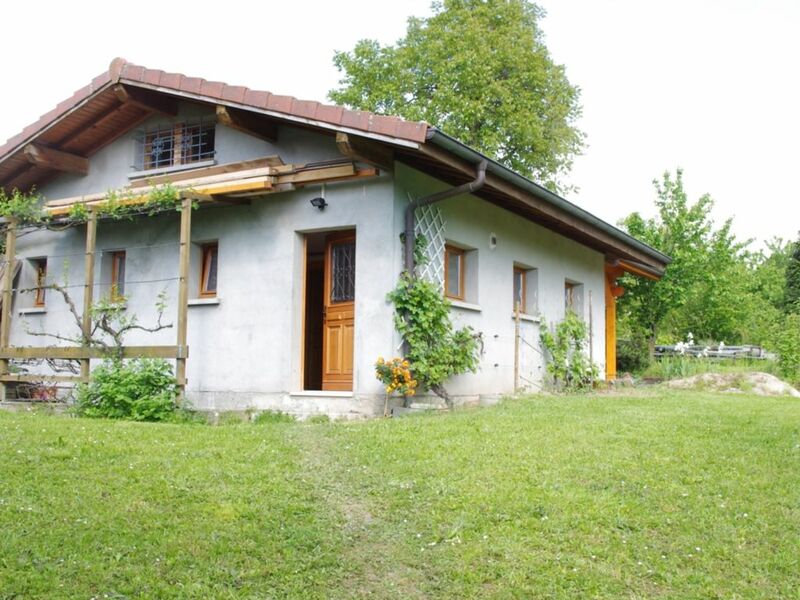 This charming cottage is located in the pre-Alps and ideally situated for relaxing family vacations in quiet surroundings throughout the year. Its location affords many opportunities for sightseeing and day trips to Chamonix and the Mont Blanc (distance : 50 km), the picturesque old town of Annecy with its beautiful clear lake (40 km), to Geneva in nearby Switzerland, the famous international city and European headquarters of the United Nations (30 km), as well as skiing, snowshoeing and hiking at many of the nearby ski resorts within a distance of 20 to 30 km(such as Les carroz, le Grand Bornand, Samoens, La Clusaz, Les Gets and so on).Also close by and well worth a visit is the Beautiful Plateau des Glières with its monument in honor of Resistance. Summer activities for all the family may include hiking along the many local trails and climbing in the surrounding mountains, bicycling (there is a bicycle path about 300 meters from the cottage) or swimming in the new community swimming pool. -le montant du premier paiement se fait à la réservation, le solde se règle à l'arrivée lors de la remise des clefs -remise des clés par le propriétaire présent sur place -Les tarifs sont indiqués pour 4 personnes maxi; au-delà de 4 il faut ajouter 10€ par personne supplémentaire par nuit. -Sur demande fourniture d'un jeu de serviettes par personne et par séjour au prix de 10€.